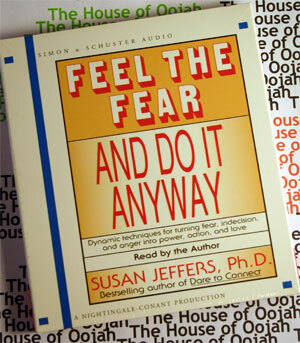 In this internationally acclaimed best-selling classic, Susan Jeffers inspires us with many dynamic techniques and profound concepts that have helped millions throughout the world grab hold of their fears and move forward with their lives. Inside 'Feel the Fear and Do It Anyway' you'll learn what we are afraid of...and why and the five surprising truths about fear. You'll also learn how to let go of the victim mentality, the secret of making 'no lose' decisions, how to expand your 'comfort' zone, how to create more meaning in your life...and much more. With understanding and humor, Susan shows you how to become powerful in the face of your fears--and enjoy the elation of living a more creative, joyous, and loving life. Susan Jeffers, Ph.D. has helped millions of people throughout the world overcome their fears, heal their relationships, and move forward in life with confidence and love. Susan Jeffers, author of books on overcoming fearShe is the author of many internationally renowned books including Feel the Fear and Do It Anyway, Feel the Fear. . .and Beyond, Feel the Fear Power Planner, End the Struggle and Dance With Life, Dare to Connect, Opening Our Hearts to Men, Losing a Love...Finding a Life, Thoughts Of Power and Love, The Little Book of Confidence, Embracing Uncertainty, Life is Huge! plus her "Fear-less Series" of affirmation books and tapes (Inner Talk for Peace of Mind, Inner Talk for a Confident Day, and Inner Talk For a Love That Works). Her latest book is The Feel the Fear Guide to Lasting Love, which was published in the UK in May 2005 and in the US and Canada by her own publishing company, Jeffers Press, in October 2005. As well as being a best-selling author, Susan is a sought-after public speaker and has been a guest on many radio and television shows internationally. She lives with her husband, Mark Shelmerdine, in Los Angeles. What makes the work of Susan Jeffers stand out? A look at the masses of thank-you letters she receives reveals that her fans--young and old, and from a whole array of life situations--love her humanness, her humor, her willingness to reveal so much of herself, the universality of her message, and the easy-to-understand style of her writing...a winning combination, indeed. They report, "It's as though she is speaking directly to me." The connection is truly felt. And connection is what Susan Jeffers is all about. "Susan Jeffers is attractive, articulate, artfully commanding..."